Wednesday night Matt and I were suppose to be out to dinner and enjoying the King of Leon show here in Denver but sadly that show has been postponed 2 months! SO Matt worked late instead and I didn’t have anything in particular that I planned to have for dinner. 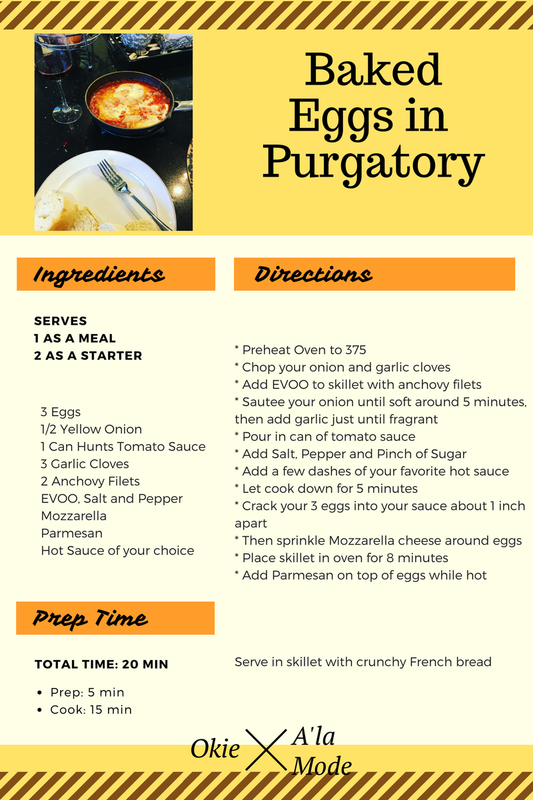 I scrolled thru Pinterest and stared into my pantry and realized I have always wanted to make Eggs In Purgatory. I read thru a ton of recipes and then settled on creating my own! There is something so amazing about eggs nestled into spicy tomato sauce and it goes so well with a glass of red wine. Its the perfect savory appetizer or in my case dinner for ONE! I will say that having French bread on hand is the MOST important thing! Its the perfect vessel for the eggs and dunking into the sauce! It’s weird how much I loved this and I knew I HAD to share this with you guys today! I hope you all love this and I would love to hear if you enjoyed it as much as I did!!! Enjoy friends!